It is somewhat unfortunate that so many of our ideas about the Industrial Revolution and business come from the novels of Charles Dickens, a man who was undoubtedly a literary genius but also one who did not really approve of people working, which sits ill with his own well known workaholism. Dickens's novel of the Industrial Revolution, Hard Times, has much to recommend it, but it does not give as true and real a picture as Mrs Gaskell's North and South, the best book on the subject in Tory Historian's opinion and published in exactly the same year as Dickens's novel. Incidentally, neither of those writers was over-impressed by the nascent trade union movement. Let us move on to the subject of clerks. Who can forget Dickens's miserable, downtrodden clerks who never seem to think of getting another job? Sometimes they break out and become rather eccentric, at other times they become positively villainous. Either way, being a clerk is a terrible fate that ought not to befall anyone. It is, of course, a fate that befell many and, curiously enough, few people considered it to be the lowest pit of misery. Indeed, it was seen as a good steady employment for many young men who wished to rise in business, earn enough money to marry and have a home. Before that, it was a good steady job for young men who simply wanted to earn money and have a good time. At least three of Jerome K. Jerome's men in a boat and, subsequently, on a bummel are clerks. Mr Pooter is a clerk and so is his son, Lupin, who will go far, having started as a clerk. Another writer who admired clerks and, generally, people who worked for their living, even women who were acquiring jobs and careers in the 1880s and 1890s was Sir Arthur Conan Doyle. Tory Historian has been re-reading the Sherlock Holmes short stories, has finished The Adventures of Sherlock Holmes and has gone on to The Memoirs, while attempting to keep some sort of track of the dates in which the various stories take place. 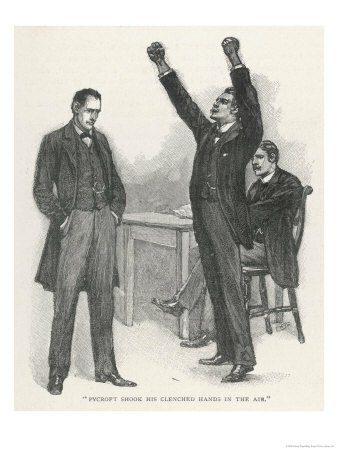 The Stockbroker's Clerk was published in the Strand Magazine in 1893 and takes place in 1889, about three months after Dr Watson's marriage. There seems to be some discrepancy as to whether the good doctor continued to visit Holmes regularly after his marriage or stayed away for months on end, working to build up his new practice and happy in his marriage. Some stories say that he was busy and happy but still found time for his old comrade, others imply that the two rarely saw each other. There are further discrepancies as to whether Holmes ever visited the young married couple. Sometimes Dr Watson asserts that nothing would drag Holmes out of his rooms except a case and certainly not the sight of a happy marriage; at other times the story begins with him arriving on the Watsons' doorstep. This is one of them. TH is not linking to a Wiki account of the story because that is definitely not something that is done. One must not reveal such matters. Suffice it to say that the plot is one used before though with important differences in The Red-Headed League and was to be used again The Three Garridebs. Oh and there were seven illustrations by Sidney Paget, one of which can be seen above. What struck TH, however, is Doyle's or rather Watson's favourable and very typical description of the young clerk who comes to Holmes for assistance. The man whom I found myself facing was a well-built, fresh-complexioned young fellow with a frank, honest face and a slight, crisp, yellow moustache. He wore a very shiny top-hat and a neat suit of sober black, which made him look what he was - a smart young City man, of the class who have been labelled Cockneys, but who give us our crack Volunteer regiments, and who turn out more fine athletes and sportsmen than any body of men in these islands. Come to think of it, Dickens would not have liked the crack Volunteer regiments or the fine athletes either. The Political Class and their Support for the EU. He ought to know. The other speaker will be Simon Heffer, journalist, polemicist and historian. Tickets: £10 to be paid at the door but that will include drinks afterwards. 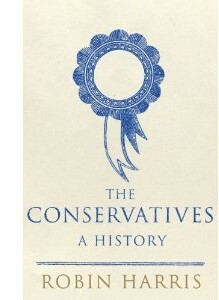 Tory Historian's attention was called to a fascinating source for the study of conservative history. The Duke University Press has set up a site on which you can read Thomas Carlyle's letters on line. The collection is excellently catalogued and the site is easy to navigate. One almost wishes that one was a student of Carlyle. However, this has also reminded TH of the need to visit Carlyle's house in Chelsea. A report from there will follow. It is some time since this site has noted significant dates and it is time to do so again. Yesterday was the anniversary of the signing of the Treaty of Utrecht of 1713, which ended the War of Spanish Succession and gave Gibraltar and Minorca to Britain. As we know, Gibraltar is still British and its population has no desire to be anything else. Next year we shall all be celebrating the 300th anniversary. Today, on the other hand is an anniversary of greater sadness: the death of Sir Winston Churchill in 1965. The idea that any readier of this posting might not know a great deal about him is preposterous (though there is no need for all those bogus quotes). 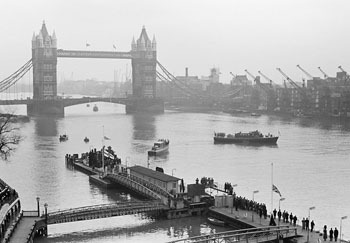 The picture is not of him but of his funeral, the cranes of London docks bowing as the Havengore takes his body to Waterloo station, a moving and unforgettable sight. ADDENDUM: I have just been reminded of something I ought to have remembered anyway. Today is also the anniversary of the death of Lord Randolph Churchill, who died exactly seventy years before his son. 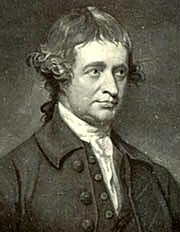 Edmund Burke's own words are, as one would expect, clearer and more sonorous than all the paraphrases other people might produce to further their own arguments. Robin Harris's history of the Conservative Party is hefty but so well written that it is a pleasure to it. Once finished, there will be a longish piece on it. In the meantime, I was interested to find a quote in the Introduction from the great conservative thinker, Michael Oakeshott. To be conservative ... is to prefer the familiar to the unknown, to prefer the tried to the untried, fact to mystery, the actual to the possible, the limited to the unbounded, the near to the distant, the sufficient to the superabundant, the convenient to the perfect, present laughter to utopian bliss. Familiar relationships and loyalties will be preferred to the allure of more profitable attachments; to acquire and to enlarge will be less important than to keep, to cultivate and to enjoy; the grief of loss will be more acute than the excitement of novelty or promise. It is to be equal to one's own fortune to live at the level of one's own means, to be content with the want of greater perfection which belongs alike to oneself and one's circumstances. With some people this is itself a choice; in others it is a disposition with appears, frequently or less frequently, in their preferences and aversions, and is not itself chosen or specifically cultivated. This is an attractive philosophy but is not, and cannot be a political ideology, let alone the basis for policy making. After all, there is just the possibility that what is in place is not quite what any true conservative would want to preserve. Then what? The monarchy is the embodiment of our history. That history is now woefully under-taught in our state school system (one recent poll showed that a large number of children were under the impression that Churchill was a nodding toy dog in a TV advertisement). Too much of our educational establishment has instead concentrated on forms of social engineering. Pupils are leaving school without the most basic knowledge of key dates and events in our history. Newcomers are given little idea of what they should be integrating into. Could not the jubilee be the perfect inspiration, the ideal moment, for a popular celebration of our national story? This could be done in simple yet effective ways. For example, could we not see the formation of acting troupes, who would visit schools across the country to present accessible, entertaining and informative shows that depict the great historical personalities and moments in British history? This can work wonders for children’s imaginations: I vividly recall, as a primary-school kid, learning about our maritime history in just such a way. And why not revive the old tradition of presenting each schoolchild with a free jubilee mug? For a modern twist, there could be a competition for the children themselves to design it. The past decade has seen a boom in public sculpture: more has been erected in our towns and cities in ten years than in the whole of the past century. So much of it is banal – meaningless to the people who live with it and too often the result of entrenched social and political agendas, which are, in any case, fast falling out of fashion. Could not the jubilee see a flowering of new commemorative public art, of the type that has been a feature throughout our history – fountains, obelisks or just simple statues? It could be financed by public and private subscription, which has been the basis for some of our most famous monuments and statues. How could one not agree? It is, in itself, a fascinating idea. Tory Historian wishes the blogger well and will be watching future postings. In addition, the first library is one TH is very fond of, the London Library. The descriptions and pictures are delightful and well worth reading and looking at. There is a slight problem: the links at the bottom do not actually link to anything. Clearly, the author had forgotten to put up the URLs. How different from Tory Historian's efficiency. For anyone interested here is the link to the London Library blog. The two great Russian questions are: Who is at fault and What is to be done. Кто виноват? is a novel by Alexander Herzen. Based on various personal experiences, it is his only foray into the writing of fiction (one has to assume that his various autobiographical volumes are more or less accurate) and not his best work. However, it is considerably better than Что делать? by Nikolay Chernyshevsky, a most appallingly boring novel with no fewer than four dreams by the heroine Vera Pavlovna and one that Dostyevsky mocked and attacked mercilessly. Astonishingly enough, given that it was written and read at a period when Russian literature produced one genius after another, this long and hectoring work was taken up and eagerly adopted as a secular bible by the Russian radical intelligentsia, particularly its younger members. This perverseness may well account for why things went so badly wrong in Russia. The title was subsequently adopted by V. I. Lenin (the anniversary of whose death is coming soon) and the best one can say for his tract of the need for a revolutionary party to lead the populace to where they do not want to go is that it is shorter than Chernyshevsky's novel. Both these questions were asked yesterday after a talk given by Luke Harding, the Guardian journalist who has had the distinction of being the first hack to be expelled from post-Soviet Russia for writing things that the authorities were not happy about, in London's Pushkin House. As it happens, he had no answer. Why Russia has gone the way it has in the last twenty years is a question that needs many hours of cogitation and discussion. Many people are at fault and by now it has become quite difficult to work out what can be done to start remedying the situation. Mr Harding's talk was interesting and centred on his personal experience from which he drew a number of obvious conclusions about Russia and its governing elite. He also mentioned his predecessors as Guardian correspondents in the Soviet Union, Arthur Ransome and Malcolm Muggeridge. He did not go into details but, had he done so, he might have noted that while the first one of those swallowed the Bolshevik line completely, to the point of becoming an agent of the Cheka while the second one (and he did refer to this) famously went as a convinced supporter, became disillusioned and was one of the first writers to tell the truth about Stalin's monstrous regime. Mr Harding, however, did not mention any journalists who had, like him, been expelled from Russia or the Soviet Union. It is, therefore, worth pointing out that the first of those was D. D. Braham of the Times, who was expelled in 1903 for writing unfavourably about the pogroms and the subversion of the Finnish constitution. Tory Historian wrote some while ago about visiting Dickens Museum on a Boxing Day and about George Orwell's essay about the great writer. That led to a very interesting discussion. However, yesterday's London Evening Standard had an item about the museum, wondering why it will be shut for refurbishment for most of the year, which just happens to be one dedicated to Charles Dickens. Dr Florian Schweitzer, director of the Charles Dickens Museum, apologised to those upset about the timing of the £3.2 million renovation. "In our opinion this is the best year to do it, because there will be many other Dickens exhibits available," he said. "When everything winds down we'll be back with more facilities and an even stronger offering." The refurbishment includes an expansion into the building next door to make the museum look more like it did when Dickens was alive. Dr Schweitzer added that the museum would arrange pop-up collections around the country during the six months it is closed. Somehow pop-up collections do not seem entirely appropriate but the argument that this might be a good time to refurbish the museum has some merit. 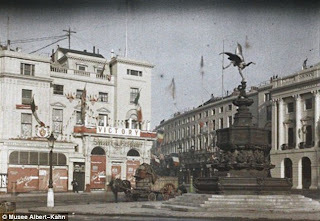 A spokeswoman for the Dickens Fellowship said: "It seems ridiculous that so many people will be coming to London for the Olympics but that they won't be able to enjoy one of the world's most important centres for Dickens lovers." The idea that people who will be coming for the Olympics are likely to spend time searching for Charles Dickens's one remaining London home and the exhibitions in it is too funny for words. ... than a collection of photographs from the early twentieth century. 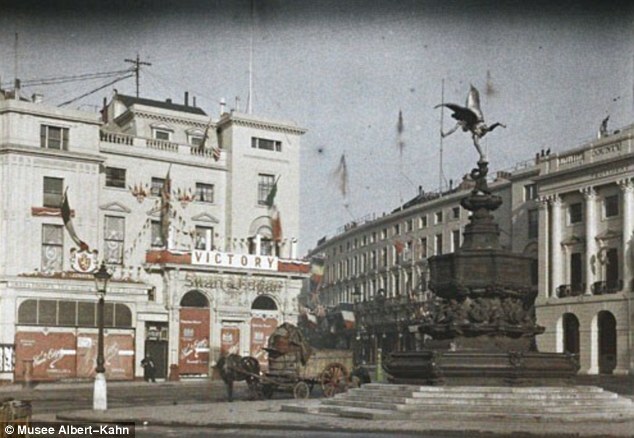 An article in the Daily Mail with some very fine examples of early colour photographs from the collection of the millionaire Albert Kahn (who died in 1940) led Tory Historian to the actual website, which gives an account of M. Kahn's biography, interest in photography and the subsequent fate of the photographs. The BBC is doing something very useful by publishing a selection of them and doing a programme on the subject. One can only hope that the intrepid BBC researchers will be able to come up with some better accounts of where and when the pictures were taken than the Daily Mail has. It is to be assumed, for instance, that the picture above is from 1918 but that is not entirely clear from the description.